Tema en 'Canciones del ayer / en idioma Português' iniciado por frida, 11 Sep 2007. Es interesante ver que en algunas impresiones ponen el título "Mais que nada", pero en otras escriben "Mas que nada". Parece que lo correcto es "Mas que nada". "Mas, que Nada!" (Brazilian Portuguese: [mas ki ˈnadɐ]) is a song written and originally performed in 1963 by Jorge Ben Jor on his debut album, which became Sérgio Mendes' signature song in his 1966 cover version. Brazilians use Mas que nada (or just que nada) colloquially to disagree with someone. A fitting English translation might be a sarcastic "Yeah, right!". 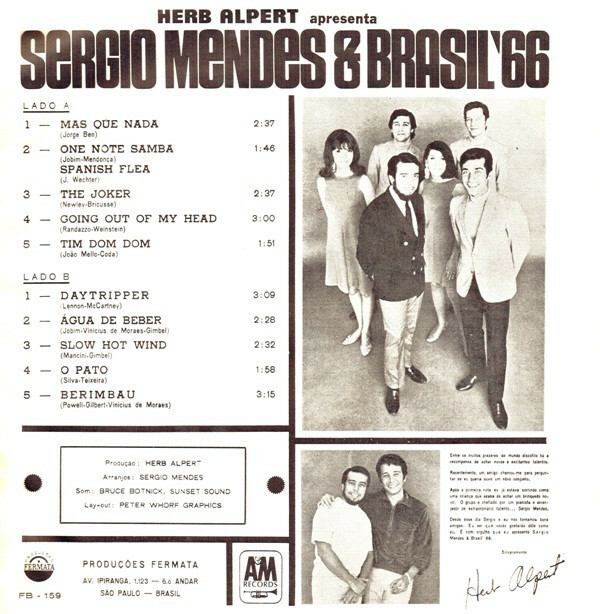 With many recordings, the title song is incorrectly written Mais que nada (Portuguese for "more than nothing") which would fundamentally alter its meaning. Also it should not be confused with the Spanish más que nada, which means "more than anything", or "above all", and is used in the sense of "mainly" or "principally". Fabricado Pela RCA Electronica Brasileira S.A.
Así que pienso que debemos quedarnos con "Mas que nada". Aquí un audio - de buena calidad - donde se puede leer la letra. Vale la pena escucharlo. Algo interesante es que una de las chicas es Lani Hall. 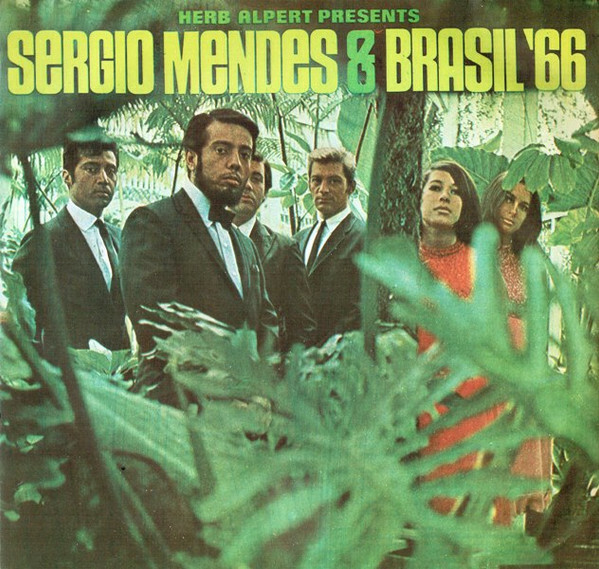 Mas que nada Composed by: Jorge Ben Performed by: Sergio Mendes & Brazil '66 Some comments about the song: - "Mas que nada" is an expression with no equivalents in english. Literally, it would mean "but such nothing". If you want to understand its meaning, imagine an expression that combines "nevermind", "no way", and "come on! ", all together. Here on the song, "mas que nada" is more like a "I don't care, I just wanna dance". - The two ladies singing in portuguese are, actually, north-americans - and one of them is Lani Hall, most known for her performance at the theme song for the Bond movie "Never say never again". Their pronounce is so good that even some brazilians do not know they're foreigners. - "Maracatu" is a rhythm from brazilian northeast with huge african influence. - "Preto velho", here translated as "old black man", is a common character in afro-brazilian culture. That's a general name used to refer both to black people's ancestors and to entities in afro-brazilian religions. Se ha registrado especialmente en el foro para decirle gracias por el apoyo.